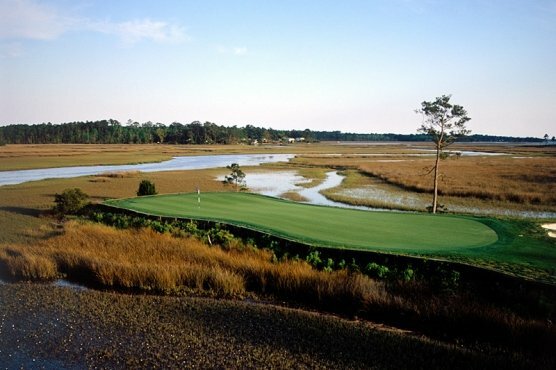 The Gene Hamm and Tom Jackson designed layout features three, nine-hole tracks – Fox, Otter and Bear. The Signature Golf Group is restoring this former favorite to its past glory. Massive renovations have taken place with the Fox and Otter courses fully restored and the Bear to follow. Protruding trees have been removed allowing the sun to shine. Cart paths have been re-paved and new carts guarantee a smoother ride. Considerable attention has been given to the maintenance of the course from all angles, tees, fairways, hazards and greens. A major clubhouse reconstruction is planned for the near future. The end result is one the ownership and management of the course can be proud. No longer do excessive trees seem create the illusion that you’re playing in a cave. The fairways were excellent and the rough was well maintained and penal. Good drives are rewarded. Even after considerable rain the past week the sand hazards were in good shape and very playable. Putts rolled true and the greens were quite quick. In addition to the numerous on course renovations River Oaks has added a large putting green at the bag drop. The driving range has also been re-worked and is in great shape. We had the opportunity to play the Fox/Otter course. At 6791 yards from the Back Gold Tees and a Rating/Slope of 72.9/135 the course is average in length. The Blue Tees measure 6345 yards, 70.6/126 and are recommended for golfers in the 8-16 handicap range. The White Tees are a comfortable 5741 yards at 70.2/122. The Red Tees measure 5043 yards, 69.7/118 and are recommended for players with 26+ handicaps. The two nines present a pleasant combination of distance and shot making challenges. Holes #5 and #6 on the Fox nine are great examples. At only 294 yards from the Blue tees, No. 5 requires accuracy off the tee to the slight dogleg left avoiding a well-positioned fairway trap on the left and water on the right. The approach shot needs to carry a water hazard into an elevated green with plenty of undulation. Club selection and course management are paramount. Of course the big hitters will like the 424-yard Par 4 hole #6. Grip it and rip it to a generous fairway with trees on each side that will only catch the most errant shots. Crank it up and hit it again to a narrow undulating green. Par is a very good score on this #1 handicap hole. The previous two holes reflect the entire course. A combination of length and shot making will provide opportunities for birdies on some holes, while pars and bogeys are quite acceptable on others. The Par 5s average just at 500-yards each. With no forced carries, they are reachable for the long hitter and only require a short iron for those of us that are distant challenged. The Par 3s do offer some variety. The Fox 3s are straightforward holes with minimal length, but strategic sand hazards will find off line shots. The Otter 3s require some length, but are not terribly penal. The Signature Golf Group is doing a great job bringing this course back, while maintaining the affordability. I’m glad I had an opportunity to take a second look.